Joseph Morgan has a lot on his plate these days. Between a millennium-long quest for the cure, forever looking over his shoulder in fear of assassination, trying to charm Caroline and cultivating his usual aura of mystery, his character Klaus is one busy Original. Hard to believe he has any free time, but he is immortal after all. Ahead of Thursday's midseason finale of The Vampire Diaries, Morgan graciously took a few minutes to speak with TV Fanatic this afternoon. If one thing's for certain with Klaus, it's that you can never be certain what he's really thinking or scheming. Centuries of solitude and being frequently marked for death in recent years would make anyone guarded. So what's his endgame in Season 4? Morgan says Klaus has dueling motivations for seeking the cure. "There are two reasons, in my mind; the first being to make Elena human again to ensure his endless supply of hybrids ... they do seem to die rather quickly," he joked. "The second would be to destroy it." Morgan alluded to his temporary desiccation "at the hands of the Mystic Falls Scooby Doo gang" at the end of Season 3 and his desire to keep his enemies close, while gaining any advantage he can. "The cure could very feasibly be used as a weapon, should be he forced to take it," he says. The near-constant plotting against Klaus, a recurring TVD theme, is not lost on him. 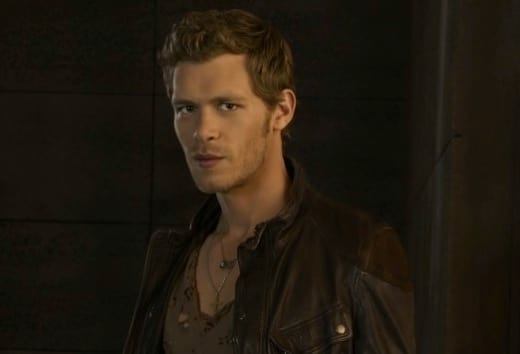 Morgan joked about a montage of clips on YouTube devoted solely to characters talking about killing Klaus, then hinted that the oft-targeted hybrid "has not forgotten" and that payback is coming. When asked if Klaus' sociopathic mean streak would remain dormant, or at least lessened as we head into 2013, Morgan said, on the contrary, "I'm certain there will be many horrors to come." Gulp. One person not on his enemies list yet? Professor Shane, whose motives - whatever they may be - have yet to create much conflict with Klaus. Very much on his radar, however, is emerging Alpha Male Tyler. Michael Trevino's un-sired character, he says, could pose the greatest threat to Klaus yet. "The de-siring of the hybrids, the gathering of [Tyler's] pack, and the inevitable confrontation, especially with Caroline now between them, is definitely building toward a mind-blowing conclusion," Morgan said. Regarding their shared love interest, Morgan said Klaus' romantic overtures and feelings for Candice Accola's Caroline (as seen in this TVD sneak peek) aren't masking any sinister intentions. Probably. "When we filmed that scene, the director told me there's an element of cat-and-mouse," he recalled. "But I think it's a playful element. He doesn't have ulterior motives, but he does enjoy the hunt." "The fact that she's making it so difficult absolutely makes it more intriguing for him." Asked for one final preview of what's to come for his character and the rest of the Mystic Falls crew in Season 4, Morgan ominously promised "there is evil in store" and that absolutely NO ONE is safe. "The writers are not afraid to kill characters, even fan favorites, and even those who have been around a long time," he said. "Some fans will be disappointed and all of them are going to be surprised." "Everything will change. It's being shaken up as we speak." On a lighter note, Morgan promised Elijah and Rebekah will both return soon, and said he throughly enjoys both Klaus' "macabre" relationship with Stefan and his "shared, playful evilness" with Damon. "If she were still human, I'd say she should be with Matt. He's so nice, so under-appreciated! Now that she's a vampire, well, perhaps she should be with whomever makes her the best vampire she can be." "How's that for not alienating any fans?" What the Hell is Professor Shady Pants doing here? Permalink: What the Hell is Professor Shady Pants doing here? This would be so much more fun if we were naked. Permalink: This would be so much more fun if we were naked. The Vampire Diaries Round Table: "O Come, All Ye Faithful"